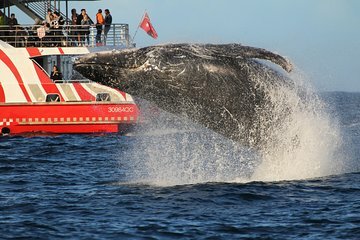 Entdecken Sie auf dieser 3-stündigen Walbeobachtungsfahrt von Sydney aus majestätische Buckelwale, die in ihrer natürlichen Umgebung schwimmen und spielen. Fahren Sie über den Hafen von Sydney, vorbei an dem berühmten Sydney Opera House und der Sydney Harbour Bridge, zu den offenen Gewässern des Pazifiks und kommen Sie den sanften Riesen nahe. Diese saisonale Tour findet zwischen Mai und November statt und Kreuzfahrten werden entweder vom Circular Quay oder vom Darling Harbour abgeholt. We were not informed prior our booking or departure that the sea was so rough, all ended up seasick despite eating the seasick pills and could not see the Whale. All 7 of us were busy vomitting in the cruise. Although we had problems finding where the boat left from, which wharf, it didn't ruin out outing. It was wonderful to see the whales up close. It was as if hey where putting on a performance for everyone. Definitely able to see whales at this time of the year. The tour guide is very friendly and provided lots of information. We spotted a whale and calf from very far away. I did get a picture of whale tail. Be preparing that sea was really rough and it is better to take some seasick medicine before you go. Overall this is a lifetime experience and worth to take it. Unfortunately we didn't spot any whale!